Here's what you need to fly in France (below, left). During my Year Of Failing Miserably at running a rag-tag teeshirts-to-the-tourists enterprise on the Côte d'Azur with a crazy Danish business partner, I thought it might be fun to do some flying in Fayence, one of the famous hotbeds for soaring (glider) world records. I had no car and very little money, but I just wanted to be able to say I had flown there once and had taken the controls for a few minutes. So I hitchhiked the 41 miles from Nice to Fayence. They told me I had to (1) get a French license equivalence, because my American pilot license wasn't worth sh*t, and (2) learn the specialized vocabulary, by reading a soaring book written in French. So I hitchhiked the 24 miles from Fayence to the Cannes Aerodrome and wangled the validation certificate shown here. Then I hitchhiked the 21 miles from Cannes back to Nice and searched all over town, looking for aviation books. Not easy. Then I read "le vol à voile," cover to cover. Even less easy, for someone who had not progressed very far beyond his introductory français-pour-étrangers courses at the Université de Nice. PS: The crazy Dane and I later used the money I saved to buy a dirt-cheap Citroën nicknamed "Blueballs." But that's another story. 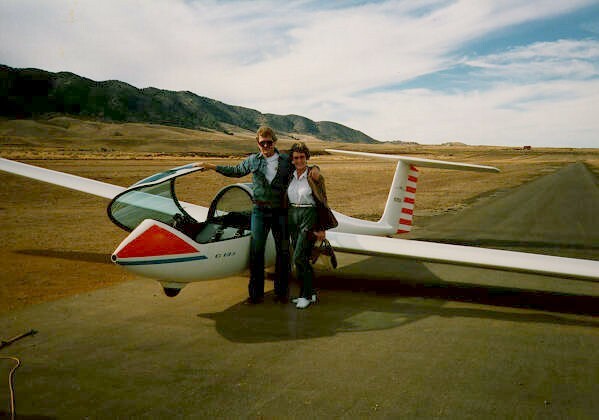 PPS: The Last Lesson - a story about my first flight instructor, my father. With the holidays upon us, I would like to share a personal experience with my family and friends about drinking and driving. As you may know, some of us have been known to have brushes with the authorities from time to time on the way home after a "social session" out with friends. Well, three days ago I was out for an evening with friends and had several cocktails, followed by some rather nice red wine. Feeling jolly, I still had the sense to know that I may be over the limit. That's when I did something that I've never done before... I took a cab home! Sure enough, on the way home there was a police roadblock, but since it was a cab they waved it past. I arrived home safely without incident. This was a real relief and surprise because I had never driven a cab before. I don't even know where I got it, and now that it's in my garage I don't know what to do with it! See also: White Christmas: Berlin/McPhatter/Held and Rudolph's Revenge and Inexcusable liberties with the milkmaids and Holiday Rum Cake and Christmas tree angel and A Festivus for the rest of us and Alice's Restaurant Letter To Santa: The Ransom Note and An AZ Xmas. Boing Boing bites the big one. Boing Boing just posted a video: "Oh my God a hawk just ripped up a pigeon right in front of me and is totally just sat there eating it." 2 videos, in fact: the full 15-minute version, and a 45-second time-lapse. Why? Why? Why? Boing Boing advertises itself as a "Directory of Wonderful Things." This is not a wonderful thing, Boing Boing. This is an awful, terrible, horrible thing. Snuff films do not belong on the Internet. I am not going to provide a link to the page, for obvious reasons. Report: Unpublished J.D. Salinger stories leak online. CNN: Literary circles were abuzz after three previously unpublished short stories by American author J.D. Salinger showed up on the Internet this week. The reported works by the reclusive writer of "The Catcher in the Rye" appeared numerous places online, including upload sites Imgur and MediaFire. They were previously only available for academic study. The 41-page album is simply called "Three Stories." It contains these offerings: "The Ocean Full of Bowling Balls," "Birthday Boy" and "Paula."